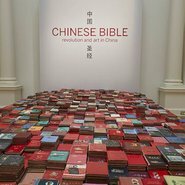 Discover the stories behind Yang Zhichao’s Chinese bible as part of the exhibition Chinese bible: revolution and art in China. Join the Gallery’s conservator Sarah Bunn and gallery host Karolin Wu as they share some of the hidden stories within the 3000 journals, and talk about the monumental task of preparing Chinese Bible for display. Join philanthropist Dr Gene Sherman to uncover the story of the acquisition of the work Chinese Bible by Yang Zhichao.